Totally wireless, incredibly lightweight and smaller than a quarter, the Thumb-Lite is a stick-on LED that turns anything into a flashlight. If you’ve ever felt the frustration of searching for something inside your dark purse or fumbling with your keys because you couldn’t see the keyhole, this seemingly simple little gadget offers an easy solution. We recently had the chance to review the Thumb-Lite to see how it stacked up to its title as the world’s smallest and brightest stick-on LED. Read on to see what we thought. We received the Thumb-Lite LED in very minimal packaging (tiny vacuum pack backed with a piece of thick paper shipped inside a small cardboard box), which we always view as a plus. There’s nothing more irksome to green product reviewers than getting a supposedly eco-friendly item packed in a gigantic box with a mound of styrofoam peanuts in it. Even before taking it out of its packaging, we could see how small and light it was. It was only a bit smaller than my thumb (hence the name, no doubt). 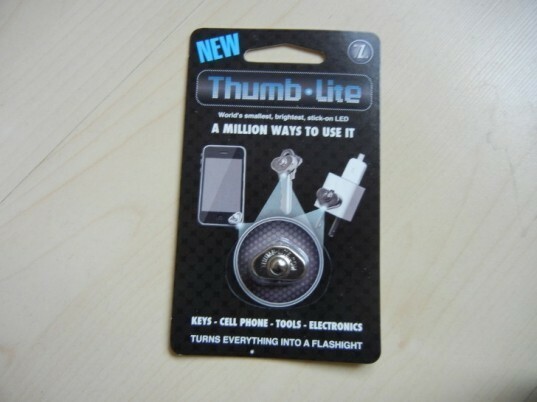 Despite selling for just $2.99, the Thumb-Lite is made of a sturdy metal casing and does not feel at all flimsy. 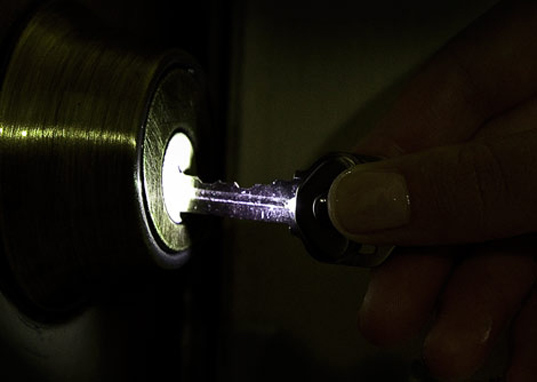 It’s really simple to turn on (just press down the button with your thumb) and the fact that you can operate it with one hand only is key – literally, if you stick it to your most-used key to help light up keyholes at night. That’s exactly the application we chose for our Thumb-Lite, so we wiped the flat surface of our key clean and dried it, and then removed the paper backing from the Thumb-Lite to stick it right onto the key. We pressed firmly and then gave the adhesive time to set up. After about ten minutes, we tried budging the Thumb-Lite to see how securely it was adhered and it was unmovable. You could probably pry it off with a nail file, but under most wear and tear conditions, this thing isn’t coming off. In terms of brightness, the Thumb-Lite’s LED is 7000 mcd (millicandelas) and has a beam as powerful as other larger LED flashlights. We even tried reading a book with it in a completely dark space and it’s totally doable (although your thumb will eventually get tired from holding down the button). To that point, we thought that adding a feature where the light can stay on without holding down the button could be useful, but then again, most people are probably not going to be using the Thumb-Lite to read, and such a mechanism might just add bulk and expense. We didn’t see much in terms of how the Thumb-Lite could be improved, except maybe to create a version that is a pin instead of an adhesive. For people who want to use it specifically as a purse light, that might come in really handy and it would be easier to swap the light out from bag to bag. Our only other word of caution is that since the Thumb-Lite is so tiny, we really recommend sticking it to something right away so you don’t lose it. The Thumb-Lite is backed by a life-time (30,000 hours) guarantee, and comes with a replaceable battery. Totally wireless, incredibly lightweight and smaller than a quarter, the Thumb-Lite is a stick-on LED that turns anything into a flashlight. If you've ever felt the frustration of searching for something inside your dark purse or fumbling with your keys because you couldn't see the keyhole, this seemingly simple little gadget offers an easy solution. We recently had the chance to review the Thumb-Lite to see how it stacked up to its title as the world's smallest and brightest stick-on LED. Read on to see what we thought.